Blockading North Korea–A Coast Guard Role? James George Stavridis (born February 15, 1955) is a retired United States Navy admiral and the current dean of the Fletcher School of Law and Diplomacy at Tufts University, a graduate school for international affairs. Stravidis serves as the chief international diplomacy and national security analyst for NBC News in New York. He is also chairman of the board of the U.S. Naval Institute and a Senior Fellow at the Johns Hopkins University Applied Physics Laboratory. So perhaps we should consider this as a serious possibility. If it happens, would the Coast Guard have a role? Certainly Coast Guard boarding teams would be high demand. 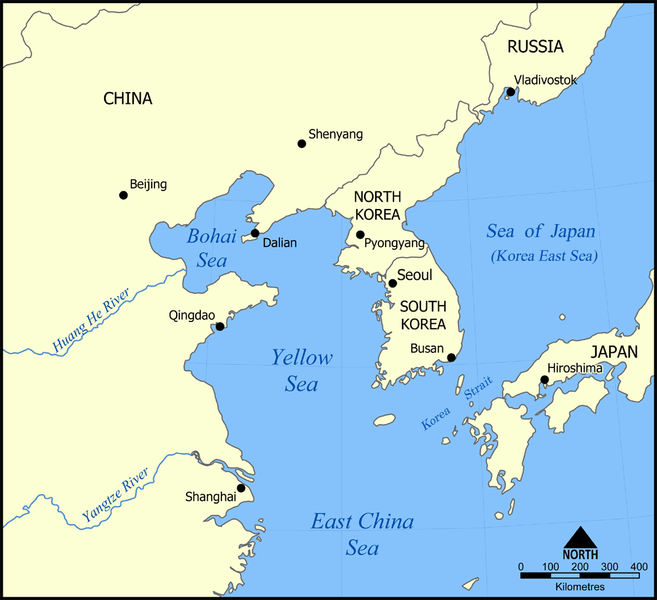 North Korea shares borders with South Korea to the South, a long border with China to the North, and a short Border with Russia to the Northeast. If the US attempts to blockade North Korean waters in the Yellow Sea and the Sea of Japan, it will bring US naval units into close proximity to both China and Russia including major Chinese and Russian Navy bases. We have to consider how they might react. Both China and Russia might be more comfortable if the blockading units operating closest to them were Coast Guard rather than Navy. This applies equally to both ships and aircraft. Certainly to protect Coast Guard units they would have to have Navy and Air Force backup. This entry was posted in Asia, blockade, Interdiction, International Cooperation by Chuck Hill. Bookmark the permalink. I’d like to think that Japan and SK would have a combined role in primary response or reaction, with our people as advisors, and as responders if needed, since this is in their back yard. An interesting related point would be, how involved would the Fleet Marine Force out of Pearl be, if the blockade actually involved USN ships. Definitely should be an international effort, but there are sensitivities involved. China and even S. Korea are very suspicious of Japan. The USCG is probably the least offensive organization to both China and Russia. With good reason, given the animosity of the last 80 years. SK would welcome us, China would be politely positive to neutral because NK is a surrogate country, and we’re gwai lo. The Russians would just want to drive the new RB-M at full throttle. Has there been any articles on the submarine fleet that NK could use in response to a Naval Blockade? Since the CG divested Anti-Submarine Warfare capabilities, this would need to come from other assets. The NK Diesel subs would be operated close to home unlike other nation submarines.